I had the opportunity to write the ELCA Faith Lens for this week. Here's what I came up with, while on a late-night writing binge with my friend Jake. Have you been surprised by the words or actions of a stranger? New York City Transit bus drivers are scared and upset. In the first eight months of the year, 58 drivers were assaulted while driving their routes. Maria Hogan is one driver who is unsure if she will be going back to work any time soon. “I have bruises on my arms and legs,” she said. Hogan believes the rider was angry because she skipped a stop in the Fordham section of the Bronx which was closed because of construction. When she reached the next stop, she says he punched her and left. Many of the assaults have occurred on the Bx9 route, which runs through the Bronx. Although MTA officials would not yet say which routes are most dangerous, the bus drivers’ union said the Bx9 is one of the worst and management is not doing enough. Union officials said that is not good enough. “Actions speak louder than words, not words without action,” said Aiken. Would you return to your job if you had been attacked in the workplace? 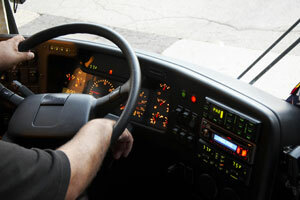 What do you think should be done to protect the bus drivers? Jesus has a lot to say in these verses. As he often does, Jesus saves his most challenging words for the religious leaders. The chief priests and elders want to know who authorized the healing and teaching Jesus has been doing. He realizes that they are trying to trick him into answering a question that has no satisfactory answer. So, instead, he dodges their questions about authority and tells a story. The story is about words and actions. A man tells his sons to go to work for him. The first one declines, but later changes his mind and does what his father asked him to do. The second one agrees, but decides to skip out. Jesus indicates that the first son – the one who said “no” at first – did the will of his father. From there, he compares the religious leaders to the second son. They say words that sound impressive to the people, but Jesus thinks their actions aren’t consistent with their words. He even takes it a step further, indicating that the lowest-of-the-low (tax collectors and prostitutes) will get into heaven before these religious leaders. “Actions speak louder than words” is an idea that is familiar to many people, but it can be difficult for grace-believing Lutherans to buy into. We are wary of the notion that our salvation is dependent on our good deeds. However, it’s important to note that the people whom Jesus is scolding are not beyond the reach of God’s love. He doesn’t tell the religious leaders that they will be excluded from heaven, but they may have to wait a while. Their great failing was complacency, believing that saying the right things was a substitute for daily obedience to God. Perhaps Jesus isn’t talking about salvation; maybe he’s reminding God’s people to treat each other with kindness and love. Our actions matter to God because God’s people matter to God. As followers of Jesus, the tax collectors and prostitutes had committed themselves to a new way of life. They were, by no means, a perfect group, but they were honest about their need for a Savior. Conversely, the chief priests and elders said a lot of impressive things, but their actions did not match their confession. They were deeply connected with the corrupt government that made the rich richer and the poor poorer. Jesus is calling us to a life where both our words and actions matter. The things we say and do reflect the One who has calls us by name, gathers us into a community of faith, and sends us out to do God’s work in the world. Why do you think Jesus is so frustrated with the religious leaders? What is Jesus saying about words and actions in the father/sons parable? Think of something your congregation talks about doing as part of its mission and ministry but rarely has time for. Create an action plan and start implementing it in future weeks. God, help us to honor you with our lips and our lives. Amen. Jon Acuff over at Stuff Christians Like asks a good question -- "Why are Christians so weird about counseling?" Perhaps Christians are just reflecting some of the cultural stigma that exist about weakness. It's difficult to get ahead or be seen as a leader if you have to admit your brokenness. An interesting conversation is unfolding in the comments section of the SCL blog. Check it out! The report of the LIFT Task Force includes a section called "Communication, Collaboration and Networks." I was given the opportunity to write this section. Though it's been edited to fit the structure of the final LIFT report, I thought I'd post the original version. “The way we connect with one another and with the institutions in our lives is evolving. There is an erosion of trust in authority, a decentralizing of power and at the same time, perhaps, a greater faith in one another. The rapid rate of change in society impacts our ministries in significant ways. The Internet is altering human behavior like nothing since the printing press. The fastest growing faith group is those who are "spiritual but not religious." Where is the church in all of this? What is our witness to the world? What is God calling us to be and do in the future? What changes are needed in order to make God's call a reality? Changes in technology and communication have moved organizations from institutional structures to network structures. One of the challenges for the church is that the larger cultural shift from institutional models to network models isn't fully realized yet. Not everyone is convinced that networks are a good thing. In some cases, these people will fight to preserve the structure they were raised with or were instrumental in creating. The reality is that people make choices. The more we can engage in learning and doing – whether in worship, in serving or in prayer, the more vibrant will be our work and our faith. Invited its members with a strategic communications background to create a high-touch, high-tech plan that incorporates methods and tools to connect with every aspect of the eco-system. Invited members to use their evangelical, missional imagination to embrace evolving and emerging forms of communication in their local context. Established a nimble denominational structure that gleaned from open-source, wiki, and Web 2.0 pedagogies to be the church in a rapidly changing world.